Founded by a Viking king. Fought over in our most famous battle. Accepted as the seat of religion. In Trøndelag, there is history in every inch of the soil. 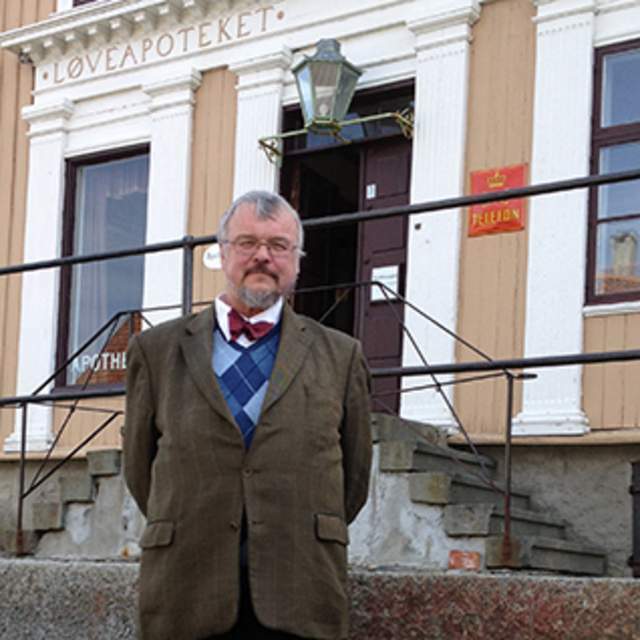 ”, says the Norwegian historian and author Terje Bratberg. That is a bold statement. Then again, Bratberg is certainly onto something. In the year 997, King Olaf Tryggvason and his army entered what today is the city of Trondheim, Norway’s third largest city and the undisputed capital of the Trøndelag region. The former Viking king chose to build his castle and port here, and he gave away nearby land for people to settle down. “Did you bring the bread?” shouts one little girl to another other. 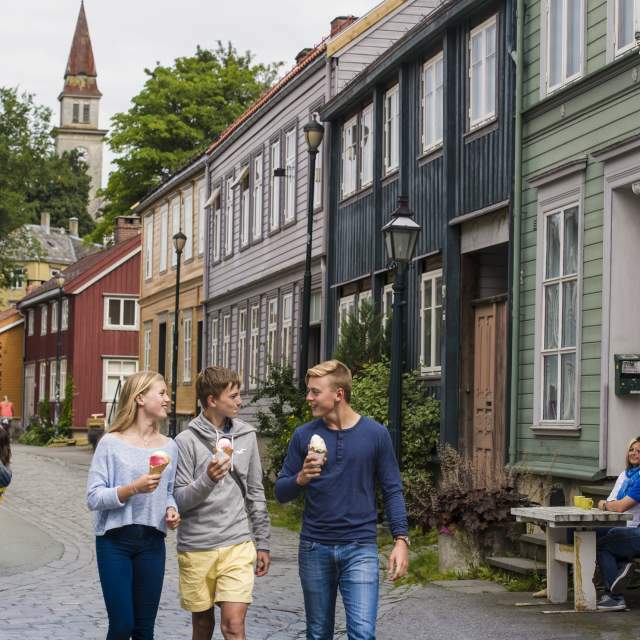 We can only see their long, fluttering blond hair as they disappear into a narrow little alley between the old wooden houses in the historic Bakklandet in Trondheim. The same area that Tryggvason settled some 1,000 years before. The small cobbled road is now a portal into one of the most picturesque places along Nidelven, the river that runs through the city. Local youth are trying their luck as anglers where the fresh water from the river meets the salty streams from the fjord. , which was built right after “the great fire” of 1681, claiming to have hauled up salmon, cod and pollack. Nearby, an elderly couple sits on a bench solving crosswords. Families with children have gathered around a small playground. And the two girls have opened their bag of old bread to hand feed a flock of ducklings that is travelling down the river. , which was built right after “the great fire” of 1681, claiming to have hauled up salmon, cod and pollack. Nearby, an elderly couple sits on a bench solving crosswords. Families with children have gathered around a small playground. And the two girls have opened their bag of old bread to hand feed a flock of ducklings that is traveling down the river. In the first 200 years after the city was founded, it rapidly grew into an important trading centre. “Trøndelag was, amongst other things, a centre for copper production. And Trondheim is an important city that connects the north and the south. For all those who have ruled the country throughout history, it has been important to master the complexity of Trøndelag”, says Terje Bratberg. Indeed, the financial growth and success of Trondheim helped build a region that did not just become a hub for the Norwegian economy. For much of the past 1,000 years, it has also been at the centre of Norwegian culture, religion, and history. In the first 200 years after the city was founded, it rapidly grew into an important trading center. “Trøndelag was, amongst other things, a center for copper production. 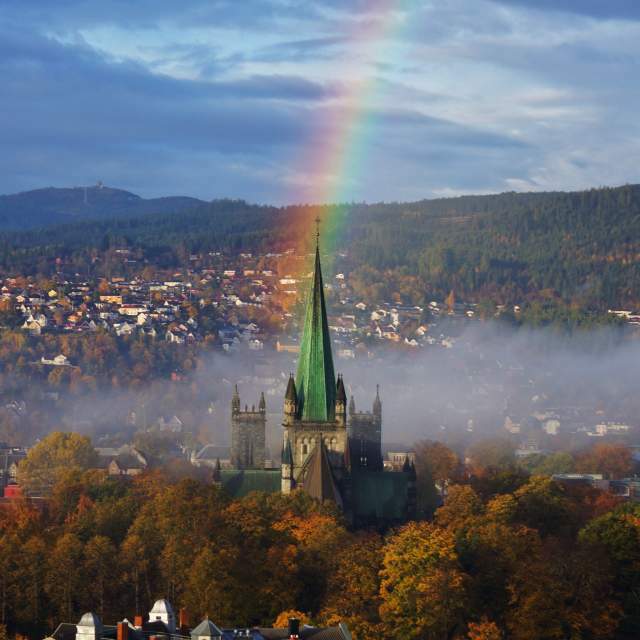 And Trondheim is an important city that connects the north and the south. For all those who have ruled the country throughout history, it has been important to master the complexity of Trøndelag”, says Terje Bratberg. Indeed, the financial growth and success of Trondheim helped build a region that did not just become a hub for the Norwegian economy. For much of the past 1,000 years, it has also been at the center of Norwegian culture, religion, and history. Nidarosdomen, the world’s northernmost medieval cathedral, is the city’s most famous landmark and serves as Norway’s coronation church. You find influences in Trøndelag both from the coastal culture in the north, the farming and food traditions from the islands, and the more urban tendencies from the south. “The most important cultural heritage in this country is found here. Like Nidarosdomen and Erkebispegården. Even if the locals of Trøndelag were really hard to Christianise, they built some of the most beautiful churches”, Bratberg says. One of those other places that hold a lot of history is most definitely Stiklestad. Only a two-hour drive north from Trondheim, you’ll find the site of the most famous battle in Norwegian history. At Stiklestad, the country’s most defining historic event is conveyed and experienced every day, most famously by the large outdoor play “The Saint Olav drama”. The play is linked to events surrounding the battle. The city of Trondheim, the culture of the Trøndelag, Stiklestad, and Nidarosdomen are but a few examples of the legacies of these Viking kings. If a Norwegian history book without them wouldn’t exactly be “empty covers” as Bratberg claims, it would certainly be a lot poorer.